In the last half-decade, the adoption and use of cloud-based business solutions has been on the rise with procurement and supply management teams. 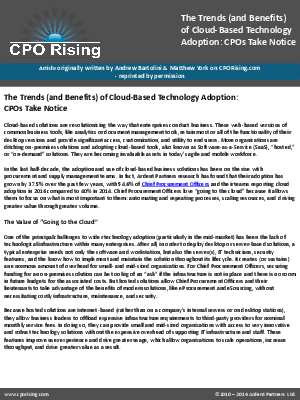 In fact, Ardent Partners research has found that their adoption has grown by 37.5% over the past few years, with 54.6% of Chief Procurement Officers and their teams reporting cloud adoption in 2016 compared to 40% in 2014. Chief Procurement Officers and their teams reporting cloud adoption in 2016 compared to 40% in 2014. Chief Procurement Officers love "going to the cloud" because it allows them to focus on what is most important to them: automating and repeating processes, scaling resources, and driving greater value through greater volume.